The first time I made almond milk, I wondered why it took me so long to get around to just doing it. There is no comparison between the taste of true homemade almond milk and the watered down versions with additives at the store. 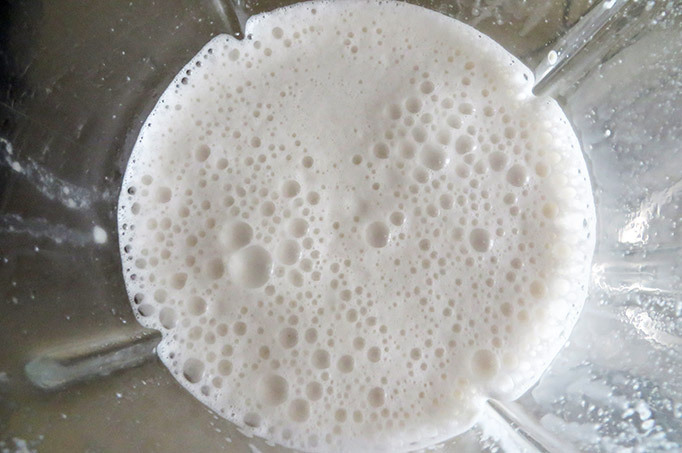 I love the pure whiteness and creamy taste of homemade almond milk, and it sure makes my smoothies taste so much better. There’s something so beautiful about the process of making this gorgeous milk. It just makes me want to eat clean and worship natural foods. Besides a blender, the only other tool you’ll need (although you can improvise) is a fine mesh nut milk bag. You can buy them online for a few dollars. I paid around $17 for mine at Living Synergy – worth every cent. Sure you can try using tea towels or make your own bag, but just buying a good quality one is so much quicker and easier – especially for people like me who can’t sew. The only extra’s I have added to my almond milk is a bit of vanilla extract and a little pure maple syrup to make it even better. This is the best way to make it if you plan to drink it on its own. Otherwise you can just make it with almonds and filtered water, or add your own little extras, such as sweetening it with dates or honey instead of maple syrup. If you want a creamier thicker milk you can just reduce the quantity of water you add. After straining the milk, the leftover brown bits are the pulp, otherwise known as almond meal once it is dried out. You can use it in other recipes that call for almond meal. Once you add homemade almond milk to your smoothies, I can tell you from experience, it is very difficult to go back to the watery store brought milk.